Holter's work permeates a range of genres, namely modern indie and electronic music as well as drawing heavily on the work of her iconic predecessors such as Joni Mitchell and Steve Reich. For over a decade now, Holter has been pumping out new work, her most recent being her album Have You In My Wilderness, released this past September. This Canadian alt-country/folk trio began making music in the early 2000's, most recently releasing their album Juno-nominated album Work and Love. Brood is a master of switching between instruments resulting in a variety of sounds ranging from the more acoustic country to electric guitar driven rock. A derivation of Minneapolis-based collective Gayngs, Poliça's roots are certainly local, however, core members Channy Leaneagh and Ryan Olson have collaborated with an impressive catalogue of artists including Bon Iver. Although typically advertised as electro-pop, Poliça's work traverses traditional categorical boundaries incorporating goth-pop, psychedelic soundscapes, and dreamy vocals. Celebrating the life and legacy of the late great J Dilla a.k.a. James Dewitt Yancy with Ma Dukes (J Dilla's Mother) and family, officially endorsed by the James Dewitt Yancey Foundation! 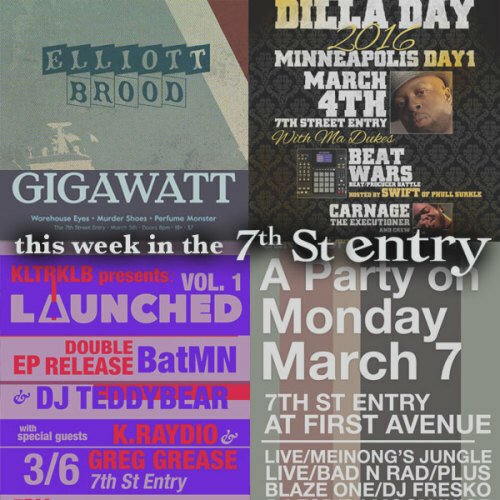 March 4 is the first night of the official Twin Cities Dilla Weekend, brought to you by the TC Loves Dilla (Twin Cities Dilla Day Committee). The event feature an epic "Beat Wars" Beat/Producer Battle from some of the Twin Cities hottest producers and beatmakers, hosted by Swift of Phull Surkle (formerly known as Gene Poole). Ma Dukes will be in the building at an exclusive Dilla merch table and signing autographs, taking pics, etc. Headlining will be Twin Cities rapper Carnage the Executioner, who's best understood as alternative, socially conscious hip hop artist whose authentic sound invokes an artistic vibe relatable to earlier breeds of hip hop. He released his first solo album, Worth the Wait, in 2011, which he followed up with his second solo work, Remember the Name, in 2012. Carnage the Executioner is also a member of local collaborations III Chemistry and Saltee. Saturday night includes an assortment of prolific young artists currently integrating themselves into the fabric of the nurturing Twin Cities scene. Dream-pop duo Warehouse Eyes combines airy vocals and a range of creative synth sound to produce a soothing extraterrestrial experience. Murder Shoes, Minneapolis-based quintet headed by lead vocalist Tess Weinberg, creates an appealing, though versatile, shoegaze-pop sound. Perfume Monster generate a clean, dreamy electronic sound which they integrate with plain sailing vocals. Launched is artist incubator program for emerging musicians created by artist Adriana Rimpel, aka Lady Midnight, in partnership with Kulture Klub Collaborative, an arts-non profit for youth experiencing or transitioning out of homelessness. Hip-hop producer and MC BatMN, and EDM producer DJ Teddybear, will be releasing their debut EP's created in collaboration with artists Greg Grease, K.Raydio, Kristoff Krane, and Medium Zach (Big Quarters). While both Launched artists have released mixed-tapes and re-mixes in the past, the EPs mark their first release of all original content. Monday in the Entry opens with Meinong's Jungle followed by Bad N Rad, both characterized by the injection of creative, and certainly danceable electronic sounds. These two are followed by an exciting line up of DJs all of whom know how to get the crowd going. Like it says on the tin: A Party on Monday.